1. The life of Pierre Bittar is based on a conscious choice of freedom. He lives in accord with his beliefs and feelings, in harmony with his personal taste. He decided to live as an artist, refusing both servitude and surrender. This highly sensitive artist, passionately attached to animate and inanimate life, is devoted to the expression of the eternal poetry of nature. He transposes in a simple, sober manner the infinite faces of nature, guided by a fine sense of observation, whose expression is not marred by sentimentality nor deformed by exaggeration. 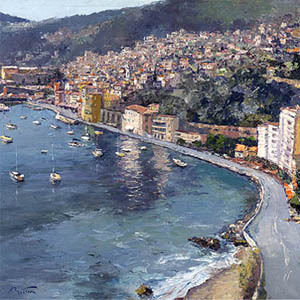 A Pierre Bittar painting is a door opening into marvels of nature. It is a stroll down a garden path in dappled light, plunging into the rich green extravagance of foliage. It is the whisper of the wind in the trees, the soft murmur of snow falling. Bittar's shows compose an enchanting invitation to contemplate Heaven and earth, trees and seasons. This intensely poetic content is sustained by a perfect technical mastery, a highly developed sense of proportions and graphic finesse. Neither purist or surrealist, the artistic temperament of Pierre Bittar is proudly indifferent to changing fashion and independent of schools and tendencies. Installing his easel solidly in the heart of his subject, he sketches, establishes the values and the scope of his painting, which is executed with a delicate power that inspires us to share his emotions. Remarkable for his mastery of color and distinguished by this combination of vigor and sensitivity, Bittar is thoroughly devoted to his art; painting according to his feelings and a personal sense of truth, he expresses his love for the beautiful, inspired by a depth of accumulated perceptions and emotional experience. Gifted with technical skill brought to a maturity and inspired by a sensitivity that has not been dulled by formal instruction. Pierre Bittar invites us to travel with him across time and space towards his marvelous inner world, bearing a message of love and beauty. Can we doubt that this expression of faith lifts Pierre Bittar up to the ranks of authentic poets and communicates the vitality of his convictions?" 2. 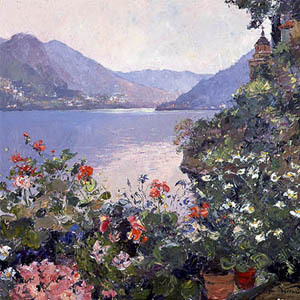 "Faithful to the first Impressionists, Pierre Bittar can only express himself in the open space of nature. When he paints the sea for example, the sensation of a surging surf influences both his color and structure. It is more like an inner music for which he is projecting the rhythm and the melody. Upon inspecting his paintings at close range, we noticed that his subject matter is secondary. Several lines of force are used to structure space and assure equilibrium, then quickly he enters the kingdom of color. Light in his work reigns as absolute master. If we carefully study the work of Pierre Bittar it is impossible to perceive the ultimate goal. The forms are in comprehensible. Only juxtaposed touches can suggest vague conformation. The work only opens up to our gaze later on, waiting for us to gain a little distance to see and feel the things emanating form the heart. To work, therefore, Bittar never seeks the subject. What preoccupies him exclusively is light. 'Whether it be a bouquet of flowers, a face, or nature, I see light.' His pictorial execution opens an important and unlimited participative field, for it requires synthesizing all these touches of organized light and in this way the restructuring of space of the painting into a sphere where emotion, always different, creates a response from the viewer. For Bittar, that is the first and irreducible necessity of art. It is for him the key to the grandeur of Impressionism. Having known how to invent dynamics in the matter of painting, capable of speaking exclusively to the hearts of beings. It required years to dominate this light of which he speaks." 3. "... a particular tenderness in the colors, a finesse in the relationships charms and seduces from the very first contact. His palette brings a lyrical quality to his pigments"
4. "... The paintings are grouped around the works of the honorary Guest, Pierre Bittar. This neo-impressionist par excellence, widely known and appreciated, can rise on occasion to the heights of the greatest 19th century Impressionists." 5. "... The impressionism of our Honorary Guest, Pierre Bittar, is an invitation to enchantment; rich in poetic content, his works are executed with perfect technical mastery." 6. "... using a technique of an infinity of slight brush strokes developed by the original Impressionists, Pierre Bittar gives us works in which we can inhale the fresh odors of the underwood in springtime, and the melancholy humidity, hushed poetry, peaceful softness of falling snow." 7. "... Bittar believes the only way to capture nature's beauty is to be in communion with it. For this reason, he paints all of his landscapes on location and avoids in-door studios." 8. "... The many moods of nature are dominant in the works of Pierre Bittar. His love of nature is reflected in every canvas and by his devotion to be true to it. He paints on location in the out-of-doors to capture even the must subtle of light play and mood. 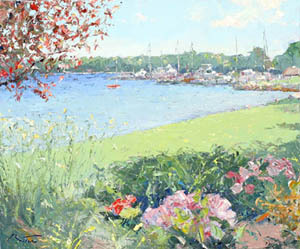 His distinctive use of the palette knife adds a freshness to his impressionistic paintings. His sense of nature is so acute as to spark in the viewer sensations of past emotions."